This NIH-conducted, double-blinded, randomized, placebo-controlled, dose ascending study evaluated two doses of lonafarnib, 100 mg twice daily and 200 mg twice daily for 28 days. 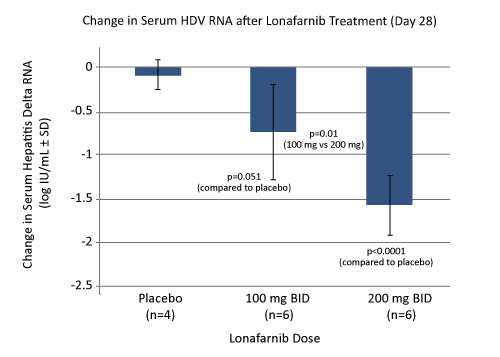 This proof-of-concept study is the first ever to evaluate lonafarnib, the first of a class of novel antiviral prenylation inhibitors, in patients infected with HDV. A dose-dependent decrease in HDV RNA levels of 0.7 log IU/mL at 100 mg BID and 1.6 log IU/mL in the 200 mg BID arm compared to a 0.08 log IU/mL decrease in the placebo patients after 28 days of treatment was observed. 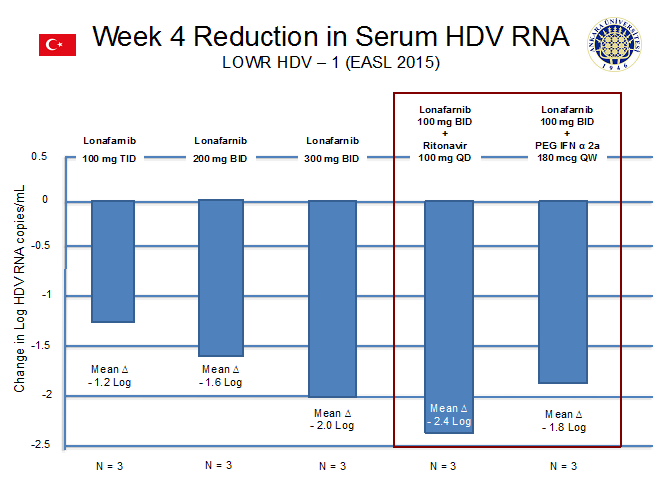 The decline in HDV RNA viral levels correlated with serum lonafarnib drug levels, providing further evidence for the efficacy of lonafarnib in chronic HDV. In the study, lonafarnib was generally tolerated, with the most common adverse events in the treatment group being mild to moderate nausea and diarrhea. Results were published in 2015 (Koh C et al Lancet Infect Dis 2015; 15: 1167-74). Lonafarnib has been studied in a Phase 2 trial in patients with chronic hepatitis delta viral (HDV) infection in Ankara, Turkey. LOWR– 1 (LOnafarnib With and without Ritonavir-1) was a parallel dose comparison study which randomized subjects to receive different doses of lonafarnib with or without ritonavir or pegylated interferon for four to twelve weeks. Lonafarnib is extensively metabolized by CYP3A4. Boosting lonafarnib with ritonavir increases serum concentrations of lonafarnib, allowing for lower doses of lonafarnib to be administered. Combinations of lonafarnib with pegylated interferon allows for evaluating additive effects of the two drugs. Data from 15 subjects who received lonafarnib alone or with ritonavir boosting or in combination with pegylated interferon all led to decreased viral loads. High doses (200 mg twice daily or 300 mg twice daily) of lonafarnib resulted in 1.6 and 2.0 log decline in viral loads after 4 weeks of treatment, respectively. A lower dose of lonafarnib (100 mg twice daily) with 100 mg daily ritonavir boosting or in combination with 180 mcg once weekly of pegylated interferon resulted in a 2.2 and a 1.8 log decline in viral load at week 4, respectively. 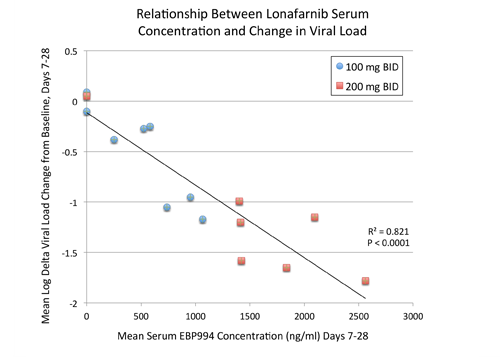 At week 8, the mean viral load declines were 3.2 and 3.0 logs for subjects on lonafarnib with ritonavir or lonafarnib with pegylated interferon, respectively. The most frequently observed adverse events in LOWR– 1 were anorexia, nausea, diarrhea, fatigue, and weight loss, and these appeared to be dose-dependent. LOWR – 2 (LOnafarnib With Ritonavir-2) is a dose-finding Phase 2 study to test a range of doses of lonafarnib boosted by ritonavir, with the aim to identify optimal combination(s) for the next longer-term studies. LOWR – 2 was being conducted at Ankara University in Turkey. Eiger reported end-of-study results at the 2018 European Association for the Study of the Liver (EASL) meeting. This study has completed. LOWR – 3 (LOnafarnib With Ritonavir-3) was a Phase 2, randomized, placebo-controlled study of multiple once a day doses of lonafarnib boosted by ritonavir. LOWR – 3 was conducted at the NIH and this study has been completed. End-of-study results were presented at the 2017 European Association ofr the Study of the Liver (EASL) meeting. LOWR – 4 (LOnafarnib With Ritonavir-4) was a Phase 2, open-label, rapid dose-escalation study of multiple twice a day doses of lonafarnib boosted by ritonavir. LOWR – 4 was conducted at Hannover Medical School in Germany and has been completed. 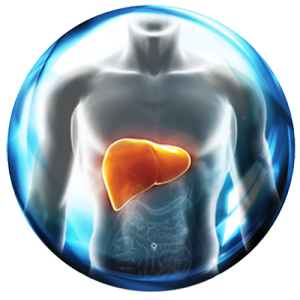 End-of-study results were presented at the 2017 European Association for the Study of the Livers (EASL) meeting. D-LIVR (Delta Liver Improvement and Virologic Response in HDV) is expected to be an international, multi-center, Phase 3 study of approximately 300 patients to evaluate an all-oral arm of lonafarnib (LNF) + ritonavir (RTV) and a combination arm of LNF + RTV + pegylated interferon-alfa (PEG IFN-α), with each arm to be compared to a placebo arm (background HBV nucleos(t)ide only), in HDV-infected patients. 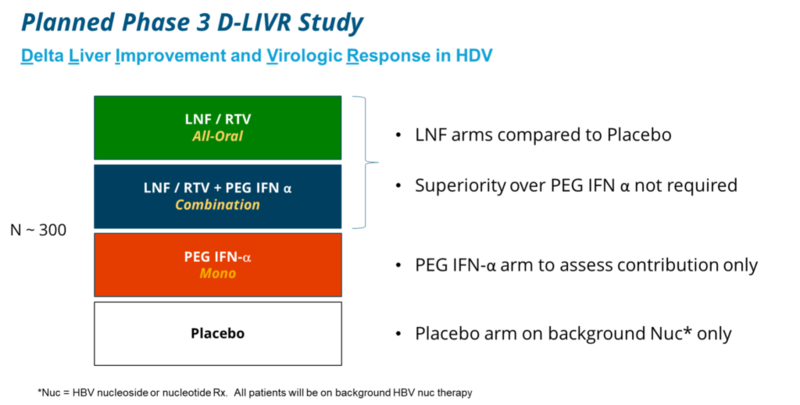 A PEG IFN-α alone arm will be dosed to demonstrate contribution of effect only. The LNF containing arms will not be required to demonstrate superiority over PEG IFN-α alone. The company is currently defining primary and secondary endpoints with the FDA.